Herbie as the alter-ego of The Fat Fury. In reality, that costumed persona wasn't a very prominent part of Herbie's series. He didn't adopt the superhero schtick until 1965, when he'd been appearing in comics no less than seven years. And even then, out of approximately 50 published stories, he fought crime as The Fat Fury only eight times. Similarly, most comics fans remember DC's McSnurtle the Turtle and Genius Jones as The Terrific Whatzit and Answer Man, respectively (when they remember those characters at all, that is) — despite the fact that their non-costumed identities were at least as prominently featured in their adventures; and in the latter case, the superhero name wasn't even used in the title of the series. One wonders if there might even be some who think of Archie less as a typical American teenager, than as the secret identity of Pureheart the Powerful. 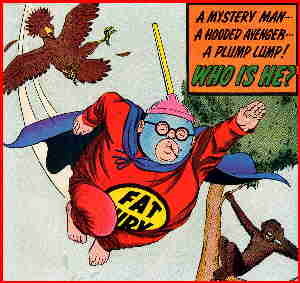 Be that as it may, The Fat Fury's origin story appeared in Herbie #8 (March, 1965). (As an in-joke, one of the superheroes he contemplated when considering adopting his costumed identity wasn't named, but looked just his artist's old character, Skyman.) He was in even-numbered issues after that until #22 (January, 1967). In #14, he met ACG's other superheroes, Nemesis and Magicman and, of course, made them look like fools. In the grand tradition of Captain Klutz, The Red Tornado, Supersnipe and Forbush-Man, he wore red long johns for a costume. "Fat Fury" had been used as a cover blurb before Herbie created that identity, but it isn't really part of the character's name. For most information on "The Fat Fury", see Herbie. Text ©2000-07 Donald D. Markstein. Art © Roger Broughton.